Emotions exists almost everywhere in our daily life these may include feelings, reactions, control of situations, interactions with the environment both positive and negatively, spontaneous events/triggers etc…. Some people show more of these emotions than others, however, understanding such emotions can help us recognise and direct emotions to a powerful outcome. You can all think of a coach who was a great athlete but lacks the communication skills to get the best out of an athlete or a boss who was very intellectual but was unable to socially interact with his employees. Well this is where you can develop and personally grow as an individual to enhance your abilities to cope with challenges that present themselves to you in your everyday life. 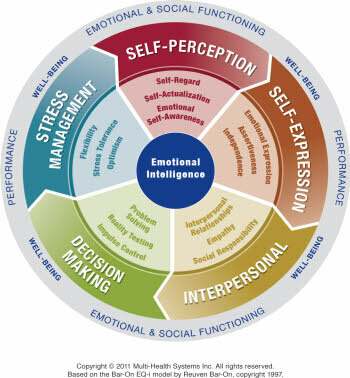 The EQ-i 2.0 is a measure made up of 5 composite Scales: Self-Perception; Self-Expression; Interpersonal; Decision Making; Stress Management and designed to assist you in understanding yourself and those around you. Within each scale there are a set of subscales that help define that category, for example, Self-Perception included, self-Regards, Self-Actualization and Emotional Self-Awareness. The scores are collected to produce an overall well-being score. It is the measures within each subscale and how they interact with each other that aids learning about ones self and their responses to challenges in the environment. This measure also includes a happiness scale that is separate to the EQ-i score and relates to overall emotional health and well-being in relation to one’s life. This profile can be used as a tool to promote personal and professional development and life skills. The EQ-i 2.0 has the potential to create awareness about facets of your emotional and social functioning to enhance your ability to interact with others and deal with challenging situations. Understanding your strengths and how they interact with your personailty is a powerful way to learn and personally develop. As a self help life coach you will be able to work on areas of your emotional intelligence to improve interpersonal relationships and your ability to make decisions. Take then assessment and recieve a comprehensive profile explaining your emotional intelligence and providing you with information to help develop it further…. To proceed please click here…..